Maidens of Worth: It makes me feel like singing! Do you have a hard time starting the day? I often do. Especially when it's cold, it's hard to force myself out of my comfy, warm bed and face the day with joy. Somehow the morning always seems to come too quickly. However, I've discovered an excellent way to give me energy and joy each morning. How? Take a walk! "But it's cold!" you may protest. Yes, it 'tis. But by bundling up in a winter jacket and mittens, I've been fine. And the colder it is outside, the brisker my walk tends to be. :) Yes, I do admit, I have it better for walking outside since I live in Alabama, but we still get our cold spells. Though it's sometimes hard to force myself out into the frigid air, I'm always glad that I did. I walk around 7:30 or 8 AM, after getting dressed and having devotions. I grab my small verse binder, slip on my shoes, and step outside to be greeted by my trusty companion, Midnight. 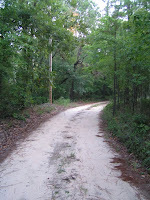 Inhaling the fresh air, I head up the dirt road, reviewing Scripture as I walk. These morning walks have given me time to memorize chapters and even whole books of the Bible. Somehow the rhythm of walking helps me learn the passages, and gives me time to focus on them. When the daily review and memorization is completed, I tuck the verses away and enjoy the beautiful creation around me, often praying as I walk. The prayers and thanksgiving well up inside my heart as I enjoy the amazing world God's created. I'm spoiled, I admit. Not many have the private dirt road I have to enjoy every morning. From summer with its buzzing bugs, to the fall's vibrant leaves, to the frigid, bare trees of winter, to spring's birds and flowers, I enjoy watching the seasons change as I walk. Even if you don't have a secluded lane, however, most neighborhoods have a pleasant sidewalk you could take. I don't make it out every morning (and usually not on weekends), but I always miss it when I don't. I've even been known to take an umbrella when it's raining and I had my heart set on a walk. :) Sometimes the sky is gray and dreary, but most times, at the particular spot I turn around to head back towards home, I look up at the sky and see the most overwhelming, clear blue through the trees. It takes my breath away every time. My attitude upon my return is much better than when I left. My mind is clear, my eyes shining, and my body invigorated. My heart is often full of songs. Sometimes I can't help but sing, and as I open the door my family is greeted with a rendition of "Oh, what a beautiful morning! Oh, what a beautiful day!" as I blow inside, eager for breakfast. No matter how busy I am or how many things I have to do that day, my outlook is always better if I first take 20 minutes for a morning walk. Though it takes time, it helps me work faster afterward, so it's time well spent! What about you? Do you have something that brightens your day each morning? 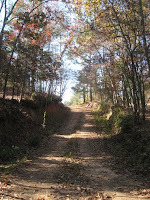 The included pictures were taken of our road in summer and autumn. Right now it's pretty bare, but spring is in the air - and I can't wait until it's green again! My friend mentioned your blog in one of her blog posts. I looked at your blog and I find it friendly and inviting. I hope you don't mind that a complete stranger to you is subscribing to your blog. I'm going to look forward to reading your future blog posts! Those pictures look amazing. :) Thanks for sharing. I jog some. But if it gets below at 50 degrees and the wind is blowing I don't go out. As much as I need the exercse, I can't stand wind burn! This makes me smile...I've even had the opportunity to make memories on that road. As to singing, I know exactly how you feel! What a wonderful post! I love to walk and it always lifts my spirits. My rule up here in Maine is if it's below 30degs., don't go out!